We are expanding our rental and lease fleet of scales to better serve our customers. Its that easy, no wires, no cables, just place on your jack that has the one inch hole mounting and your ready to go! HH2400-3-10CS Wireless Handheld transceiver, top of jack load cell kit. 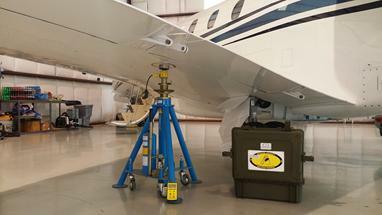 This kit is for light to medium aircraft, top of jack mount, easy to use and available to rent, lease or purchase. If you rent it, like it, you can buy it! Our HH2400-10CS kit is now on line in the rental pool. This little kit is fully wireless, runs on our HH2400 Handheld transceiver (supplied) and can weigh up to 10,000 lb per point for a 30K total. This unit is a big hit with our helicopter operators, small jet repair stations and 135 operators needing their Cessna 560 or their Bell 206 weighed! Will work for many more aircraft types and then some. Security deposit required, call for deposit amount. We will take a credit card and authorize it for the amount of deposit, the rental is $500 per week. This kit is the same as our small kit, but features 25,000 lb per cell load cells. Popular for light to medium turbo prop and jets. It is fully wireless, runs on our Handheld HH2400 wireless transceiver system and makes weighing your aircraft super easy. HH2400-3-25CSThe scale to the left is one of our 25,000 lb per cell kits. This kit is one of our main line kits in use with operators world wide. The kit is a top of jack unit and will fit in the one inch hole in the top of your jack ram. All our rental kits are for sale, try it, if you like the test drive and want to purchase it, we can offer them to you. HH2400-3-50CSLC This kit is one of our 50,000 lb per cell kits. 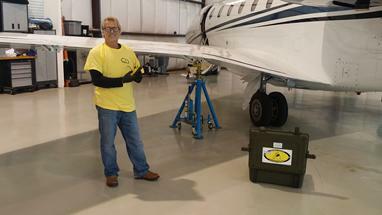 This kit is one of our main line kits in use with large jet operators, corporate jet MRO support, 145 repair stations and OEM's. The kit is a top of jack unit and will fit in the one inch hole in the top of your jack ram. All our rental kits are available for weekly rental, longer term monthly or yearly rental and of course can be purchased. Large cell kits come with our 50K large format cells. This is an important detail for proper jack point retention and safety. Our cells fit the GV jack point like a glove. Only $500.00 per week rental with a required security deposit on a credit card.